I had planned on becoming more intentional and focused on this blog. The thing with taking a new teaching position (and I had forgotten this) is that it is almost like having your first job all over again. Like I have just graduated from college and have never had a day of experience in my life. Seriously, though. I am staying one day ahead of my classes. I know Algebra and Geometry but I haven’t taught either of them on a daily basis, ever. Now I am responsible for both. I have put myself under a lot of pressure to be good, the best math teacher they’ve ever had. I know… I don’t have to but something inside me makes I feel like I need to. Most of the kids in my classes struggle with math and have never felt great about it. Many are just trying to get their last math credit so they can graduate. Some of them won’t make it to graduation before they drop out. I put this pressure on myself because I want my students to know they are loved, valued and capable of being successful. I want to engage their brains. I want to hold their hearts. I want to be that teacher that they think of when asked about the best parts of high school. I want to push them to be better than they thought they could be. Until recently, I never realized how much I have compartmentalized my life. The worst part is I got away with it just fine without knowing how it haunted me. The best part, though, is now we are in a place where it is no longer possible for me to compartmentalize and suddenly I feel free. I seem to be a different person or play different roles depending on where I am and who I am with. Work… for at least the last 2 years that I taught in St. Louis I played the part of a victim… and I played it well. I had horrible classes, worked on a super dysfunctional team. I lacked compassion and understanding I was emotional, had a short fuse, complained, vulgar and was not the teacher I know I can be. I would be embarrassed if people outside of school saw me that way. Church… the greatest thing about my church in St. Louis (beside the awesome worship, children’s ministry, teachings, small groups, etc.) was the fact that it was pretty far away from school. Half the people hadn’t even heard of my school district. Most of the people at school would never venture out to my church. No overlapping there. I could be holy and wise in front of those people but leave it at the door when I left. Family… I love my family. I am so fortunate to have amazing parents and a super cool sister and brother. But I have always felt a bit on the outside with them. I am the weird one- with a different personality and interests. The one left under a rock by gypsies. I play this role well with them. Sometimes this is painful but other times I crave it because that is who I think they expect me to be. Spouse… when my husband was a police officer he worked crazy hours. I hated that I was alone when I was at church or with my family but it made it very easy to be a yet another person when I am with him. It is he, in fact, that first pointed out to me how different I am in various settings. How I seem to change personalities depending on what the situation called for. Pampered Chef… at my cooking shows and PC meetings, again, I play another part. This is the one I thought I wanted to be… loud, wild, silly, sarcastic, fun. I am not sure that is the best person for me. This is the second place I began to recognize this compartmentalization. Online… I have become addicted to social media- twitter and facebook. There I laugh about my kids and make jokes about what I see and feel when really I am unhappy. This is the easiest place to be anonymous. Until recently, I have kept this as a separate part of my life. But now things are changing. They say in a small town everyone knows everything about everybody. At first I didn’t think it would be a big deal because I was the new girl in town and no one would care about me. Now I realize I can’t separate my life into groups that are scheduled into my daily calendar because everything here is so meshed and overlapping. There is no escaping who I am now. I work with people from church. Parents of my students have had Pampered Chef parties for me. I can’t be 13 different people. I boohooed in church this weekend because I think it finally hit me. I “present well” whenever the situation calls for it. I have compartmentalized my whole life in order to hide who I am. But it is time for me to get real. God is calling me to be who he made me to be and for 30 years I have resisted that. I haven’t taken the time be who God wants me to be because I am so busy being who I think everyone else wants me to be. I can talk a lot and I act like I know what’s going on… and if I don’t, I can fake it with the best of them. But I realize I can’t fake it. Anxiety is driving me insane. Depression is drowning me. I am stressed out trying to be something else.. So who does God want me to be? I am not sure yet. I do know He calls me to love Him first and foremost. I know, for sure, that I have failed at that. I know I am called to reach out, in compassion and love to others regardless of the location and situation. I haven’t been good at that in a long time. I have been asked by numerous people why I call my kids Bubba and Dude. I am not paranoid, super private, weird, or native to a rural community so they wonder why don’t I refer to my own flesh and blood by their real names. Let me start by saying it is sort of my fault but I can’t take full responsibility for the name changes. Until recently Dude would correct me anytime I would use their Christian name. Now, the nicknames have stuck. Since we now live in small town America, the names actually fit. I can’t wait until they start school and tell the teachers they prefer to be called Bubba and Dude. Names fascinate me. I love when a name has a good story behind it. Tell me how you got your name. Did you “rename” yourself? What was it and how long did it stick? In less than 2 weeks I will start a new job as a high school math teacher. 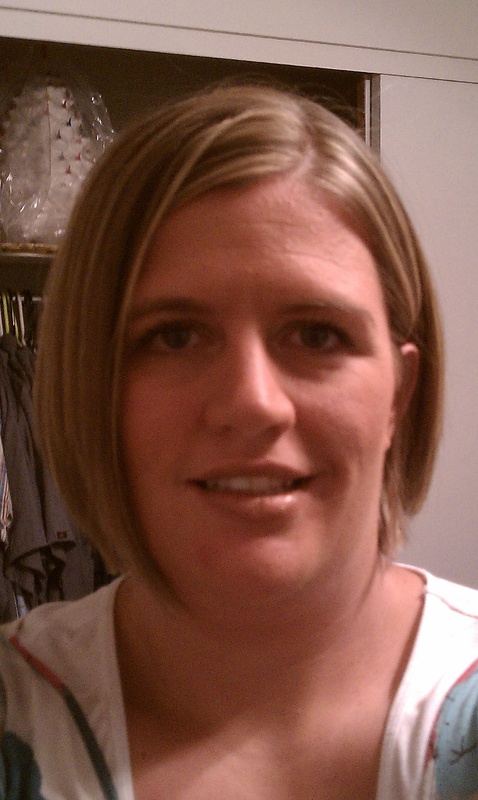 I decided that it might be time to get a “grown up” hair cut in order to attempt to look older than my students. I have always been an extremest… really long or really short hair. It has been 6 months since my last trim (my sister is cringing at the thought). Before that it had been more than 2 years since scissors had touched my hair (she gets sick to her stomach when I mention that). 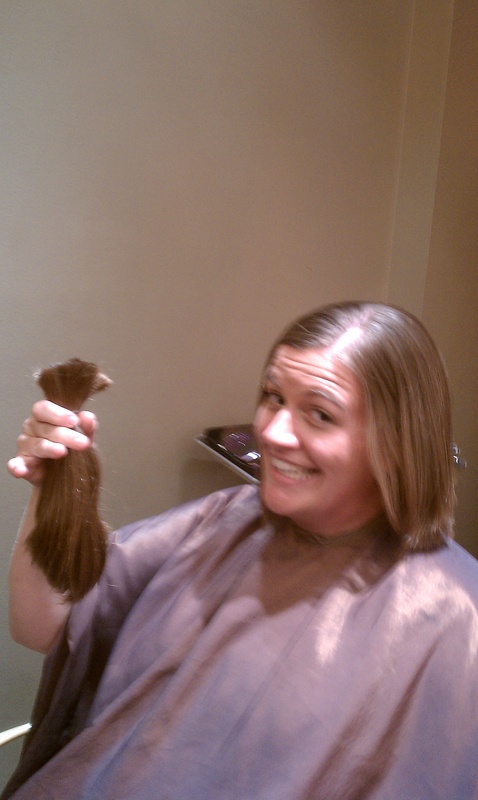 I decided this time around I would hack it all off and donate it to Locks of Love. I have a ton of hair and I hate to waste. My brother and husband are quite jealous and wished I would have donated to them. This is the before shot. Please ignore the bags. Look at that pony tail. 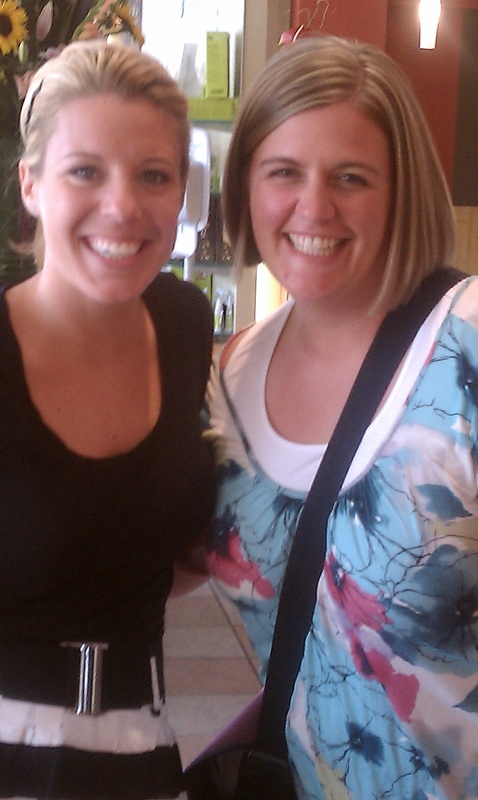 I went to see Miss Allyson. My brother’s girlfriend. Also, the object of Bubba and Dude’s affection. None of them (Doug, Bubba, or Dude) was happy about us getting together on Saturday. My sister was there to hold my hand through the cutting process but I still had to drink a glass of wine before we actually started cutting. Allyson strained to get through my hair. You should have seen her face as she cut. 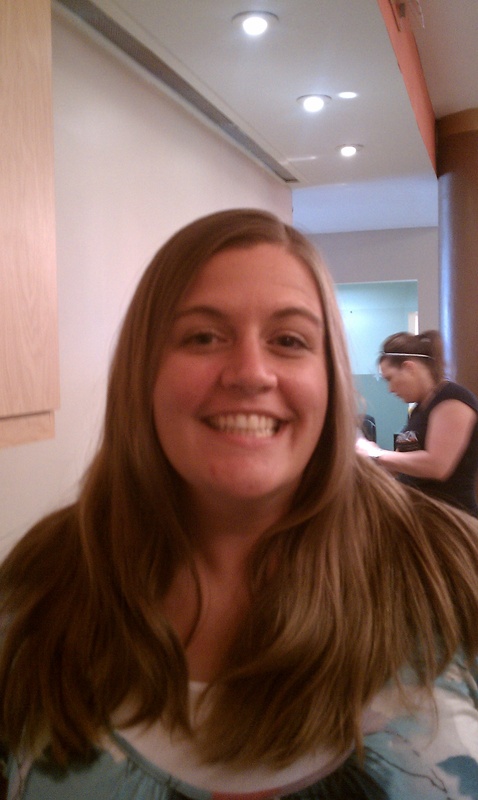 I have a picture of it that I will save for blackmail because it does not reflect how beautiful Miss Allyson really is. Nearly three years of growth in my hand. I thought I would cry but I was actually relieved. I lost about 5 pounds. The tension in my head was relieved. Who knew I was working so hard just carrying my hair around? If you look close, the front doesn’t look so bad. The back, however, was not so good. 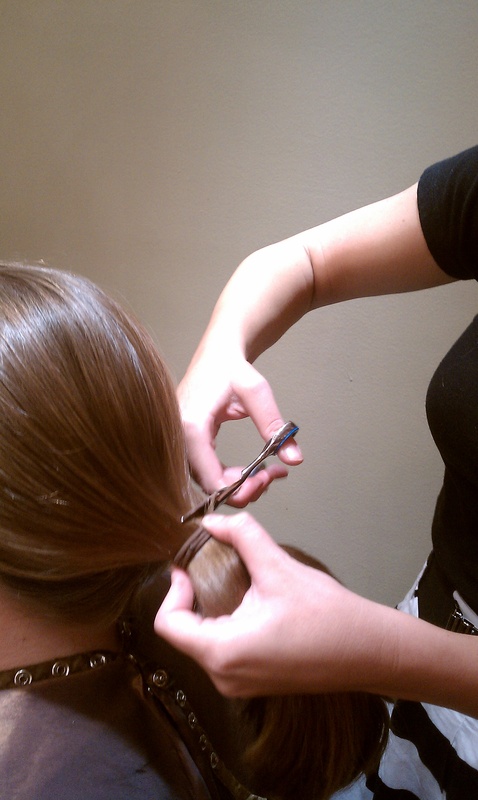 It turns out, cutting your pony tail off is not the best hair styling technique. It is almost as if she cut a hole in the back of my head. It took almost an hour to clean it up. It is super short back there. She had to use clippers. Thank goodness Miss Allyson is a perfectionist and very good at what she does because it started off looking like I had a bad accident with a preschooler and a pair of garden clippers. My sister decided that I needed to go blond. She is much better at the beauty queen thing than I am so I went with it. 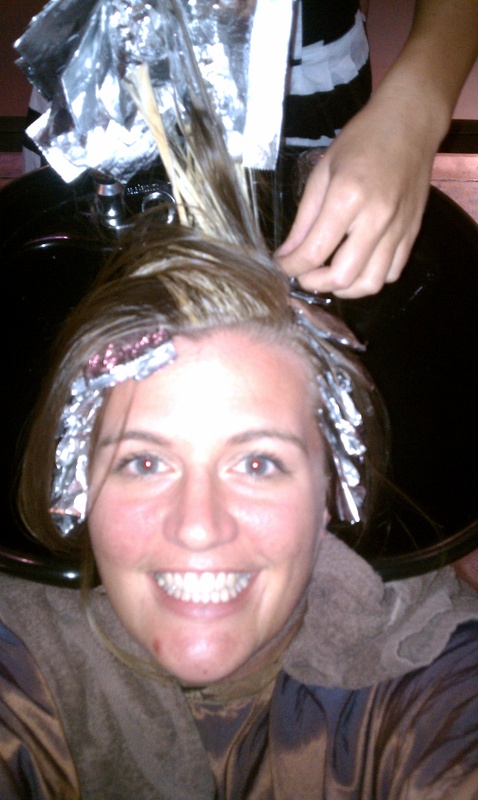 Here is Allyson taking the foils out. She washed my hair AND MASSAGED my head with blue oil. It felt awesome!!! My brother showed up at this point and broke up with Allyson (not really) because he didn’t want me to cut it off. Please ignore the super shiny forehead and the large, alien-like growth on my chin. I should have worn make-up for the pictures. I drove 4 and a half hours to get my hair chopped by someone I know. 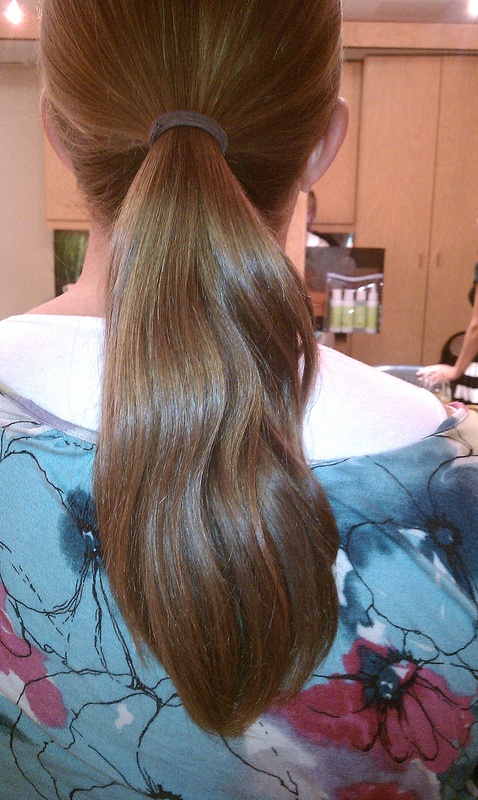 I spent nearly 3 hours in a chair at Studio Branca in Creve Coeur, MO. I came in with hair half way down my back. I left with a super cute bob. Yes, I am probably going to grow it back out but I think I will maintain for a little while because it feels good to look good. The back is a lot shorter but I didn’t get a picture after Allyson styled it and I am pretty sure my version doesn’t do it justice. I think it kind of wedges… gets longer as it comes to the front. I really don’t know the terminology since I don’t read fashion magazines or anything. Please ignore the neck-chin region. 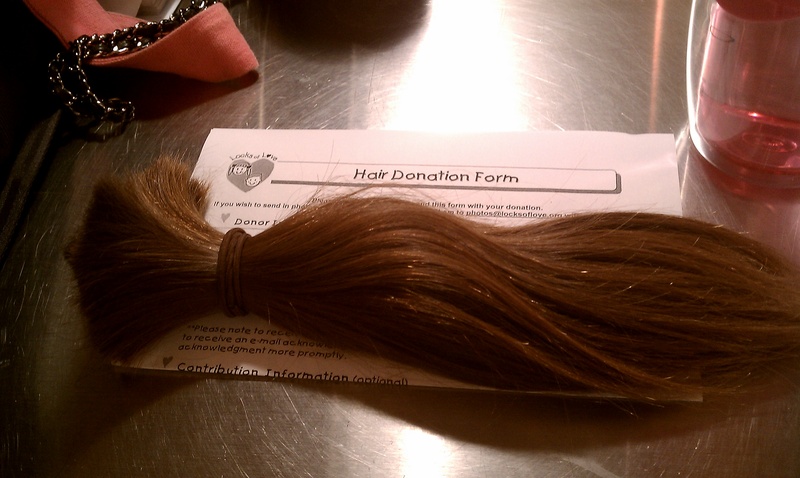 Here is my hair on top of my donation form. By the way… I am now a proud owner of a straightener, a paddle brush, and some goo for my hair. Go me.